awwwww! thats so cute! The kitty looks just like my cat!!! 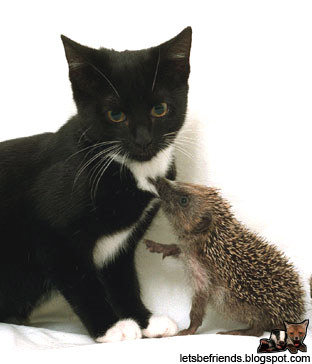 I think that little hedgehog is infatuated with the kitten, who looks thoroughly disgusted with the idea. I love that photo! 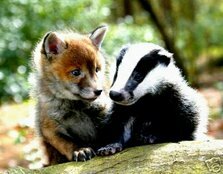 what an adorable picture!!!! where did you get it? ha ha, teeya matthews. very funny. hello, all y'all out there, all my fans. that picture is sooooo cute! I love the kitty! hey kristen I would like to talk to you and know more about you (don't worry, I'm NOT a guy!!!) So, post a comment to me on any comment section with horselover on it. I'll get it and answer back. bengal kitten for sale surfing tonight looking at bengal kitten for sale info, I happened across your blog. I had to say that I agree with it all! Now back to my search for bengal kitten for sale information! horse pictures is a topic I cover on my site. Your readers might be interested in checking it out further. Oh My gosh. That is just adorable. I can't believe how much that kitten looks just like a cat I recently rescued from starvation. She is so precious. Adorable! That cat looks just like my uncle's cat. And his name is Rob too, lol.